For the 24 hours to 23:00 GMT, the EUR declined 0.19% against the USD and closed at 1.1282. On the data front, the Eurozone seasonally adjusted construction output climbed to a 2-year high level of 3.0% on a monthly basis, in February. In the prior month, construction output had recorded a revised drop of 0.8%. Separately, in Germany, the ZEW economic sentiment index jumped to a level of 3.1 in April, surpassing market expectations for a rise to a level of 0.5. In the previous month, the index had recorded a reading of -3.6. Meanwhile, the nation’s current situation index eased to a level of 5.5 in April, less than market consensus for a fall to a level of 8.5. The index had registered a reading of 11.1 in the previous month. The US dollar gained ground against a basket of currencies, amid upbeat housing market data. In the US, data indicated that the NAHB housing market index rose to a level of 63.0 in April, marking its highest level in six-month amid fall in mortgage prices and at par with market expectations and. In the preceding month, the index had recorded a reading of 62.0. Moreover, the nation’s manufacturing production unexpectedly remained steady on a monthly basis, in March, compared to a revised drop of 0.3% in the prior month. Market participants had expected the manufacturing production to advance 0.1%. On the flipside, the nation’s industrial production unexpectedly slid 0.1% on a monthly basis, in March, defying market anticipation for a gain of 0.2%. In the prior month, industrial production had recorded a rise of 0.1%. In the Asian session, at GMT0300, the pair is trading at 1.1300, with the EUR trading 0.16% higher against the USD from yesterday’s close. 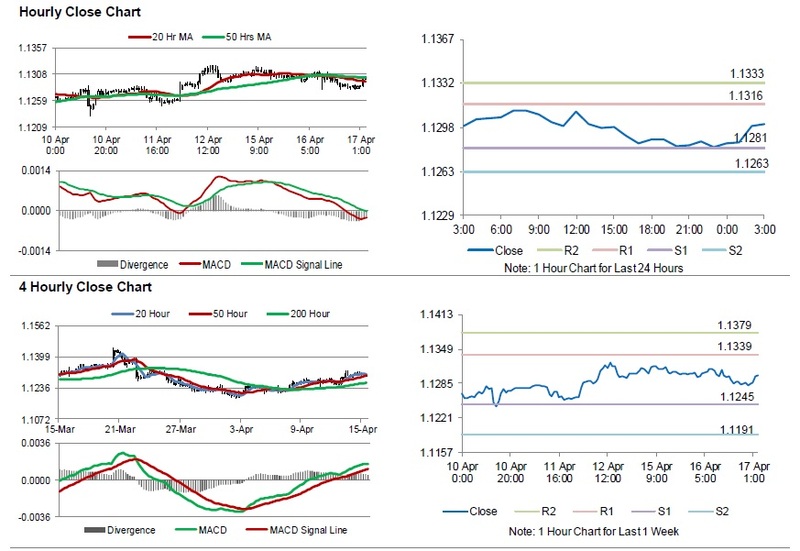 The pair is expected to find support at 1.1281, and a fall through could take it to the next support level of 1.1263. The pair is expected to find its first resistance at 1.1316, and a rise through could take it to the next resistance level of 1.1333. Moving ahead, traders would keep an eye on the Euro-zone’s trade balance data for February and consumer price index for March, slated to release in a few hours. Later in the day, the US trade balance data for February along with the weekly MBA mortgage applications, will be on investors’ radar. Also, the US Federal Reserve’s Beige Book set to release later in the day, will keep the traders on their toes.